Remakes are generally inferior to the original. We have seen this time and time again. A movie that is considered a classic goes to be remade, only to be hated by a majority of fans. The remake of Friday the 13th (2009) is a prime example of this and to many, Rob Zombie's remake of the John Carpenter classic, Halloween, is too. I happen to be a fan of both so I thought that I would take a look at the movies and give you my thoughts. I want to get this out of the way before I proceed: I am all for remakes. I like to see how other filmmakers see material. There have been a lot of remakes that have worked for me, even ones outside of the horror genre, The Departed being a prime example. So I always go into a remake with an open mind and the thought that even if the remake is bad, it will not be able to touch the original. That being said let's move into the two versions of Halloween. John Carpenter's Halloween was released to unsuspecting audiences in 1978. People thought that the movie was going to be another cheaply made horror flick that would disappear as quickly as it appeared. But the film gave audiences something that they had never seen before: a cheaply made horror movie that didn't feel cheap and delivered the scares in ways never seen before. The way that Halloween scared the audience is what I think is best remembered. The scares are more real and Carpenter takes his time in establishing these scares. Take, for instance, the way that Carpenter sets up the main girls. They are just doing what they do everyday, but they are being watched very closely, but far enough away, by Michael Myers. He is like a lion lying in wait, preparing to take down his prey. This is what scares the audience: the wait. Sure, the payoff is the best thing, but Carpenter knows that the longer you make the audience wait, the better the payoff is for them. He also knows that you can't make the audience wait too long, lest they become bored. He strings the audience along until just the right moment then he springs the action on you when you least expect it. Carpenter's Halloween would go on to spawn seven sequels. The movie would also become the highest grossing independent movie, grossing around $50 million against a $300,000 budget. That is amazing for a small little horror movie that came out of nowhere. The movie would latter be dethroned by Teenage Mutant Ninja Turtles in 1990 as the high grossing independent movie. 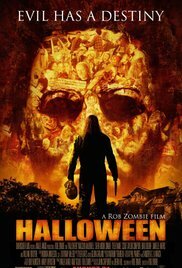 Now, Rob Zombie's remake of Halloween is a polar opposite to the original in almost every way. Instead of being a mindfuck, the movie throws everything at you and doesn't shy away from being graphic and violent. Whereas the original left things up to the imagination, Zombie decides to show everything. But that doesn't make Zombie's version worse, only different. Carpenter used a quiet pace to build his suspension, Zombie uses a faster pace that doesn't build suspension, but rather takes the viewer on a roller coaster ride. Don't get me wrong, there are quiet moments in Zombie's version, but they most happen at the beginning during the young Myers portion of the movie. When the killing starts Zombie relies on loud noise to scare the audience. One major thing that differs the two movies in the way the story is told. Carpenter gives a brief glimpse at the young Myers and then flashes forward to the present. The only thing that we know about Myers comes from Dr. Loomis, who refers to Myers as "pure evil". This sums up Myers nicely as a modern day boogeyman, killing because that is all he knows. In the Zombie version we are given a back story to Myers. He comes from a stereotypical dysfunctional family and begins killing those who pick on him. These early scenes are pretty standard in any serial killer movie, but the scenes in Smith's Grove Sanitarium are the best of the movie. Here Zombie digs deeper into what makes Myers kill and even comes up with an explanation as to why Myers doesn't talk. Zombie paints Myers as a troubled child who has deeper issues than the original Myers. By humanizing Myers, Zombie gives us a killer that we can sympathize with. We know why he is killing and therefore understand his frustrations. He is a person who wants to be left alone and when that doesn't happen he kills everyone around him. He stays a child, even after he has grown up. Some say that by giving Myers a human aspect to him that it takes away from the evil. To some degree it does, but in this day and age we feel more comfortable knowing how is stalking us. Carpenter knew that and that is why Myers is given no backstory. Zombie, on the other hand, wants us to face our fears by giving our fears a face. This makes the two Myers scary for totally different reasons. Another aspect that has been changed comes in the form of Dr. Loomis. Played by Donald Plesence in the original, Loomis is portrayed as a weather beaten doctor who is pertrified of Myers. After concluding that Myers is "pure evil", Loomis relieves himself of being Myers' doctor. The only thing that brings him back to Myers is the fact that Loomis knows how he operates and has an idea of where he is going to go. Plesence is a wonderful actor who bring a quiet fear to the role. He is a man who is haunted by the thought of Myers, but never shows it. Zombie's version of Loomis is less complex than that of the Plesence take on the role, but he is still intriguing. Played by Malcolm McDowell, Loomis is not scared of Myers, at least at the beginning. He sees Myers as a child who needs his help and the earlier scenes are played beautifully. Loomis wants to know what makes Myers tick and spends long hours talking to and observing him. When he can get no more out of Myers, Loomis stops being his doctor. Again, Loomis comes back when he finds out that Myers has escaped. To compare Plesence and McDowell as the two Loomis' is like comparing all of the different actors who have portrayed Van Helsing. Plesence plays the role very close to the body, not revealing everything about Loomis. McDowell puts more of who Loomis is out front and we see that he really does want to help this child. And last, but not least, let's talk about Michael Myers. Since he is the central part of the movie, it only seems fair. Many have said that Myers is a secondary character in the original movie and this is true. He is not the focus of the movie, but what he does is. Myers spends a majority of the time watching the female characters and their actions. He gets very little screen time because he is waiting. Throughout the entire movie, as we watch the girls going through the motions of mundane life in a small town, we know that Myers is out there, waiting for his time to strike. Carpenter knows this and keeps Myers' screen time to a minimum, so that when he does show up we are shocked. We don't know when he is going to strike, but when he does, his presence is known. Zombie's Michael Myers is a hulking beast who does some waiting, but not very much. This is the only part of the remake that really suffers. Because we are given so much time on Myers' backstory, we don't get the calm before the storm version of Myers. We know that he is there, but there is not the same dread that is present in the original. The scenes of Myers going after the babysitters is shorten and therefore the impact of his killings is lessened. So when it comes to pitting the two movies against each other, the original Halloween is the winner by a long shot, but the remake has it's qualities as well. I think that both movies represent the times in which they were made extremely well. The original was made during a time when it was still safe to not lock your door at night and you didn't have to keep an eye on your kids every second of every day. The remake was made during a time of heightened fear and showed us that fear and terror comes from all walks of life.